The AIA Utah Young Architects Forum presents the next event for the Meet the Masters series. Meet the Masters is a way for young architects and designers to connect with architectural and design mentors in Utah in a casual salon-style setting. The evening starts at 6:00 PM with a cocktail hour, followed by a presentation by our presenter at 7:00, followed by about fifteen minutes or so of discussion. The event will take place in the intimate setting of City Home Collective. 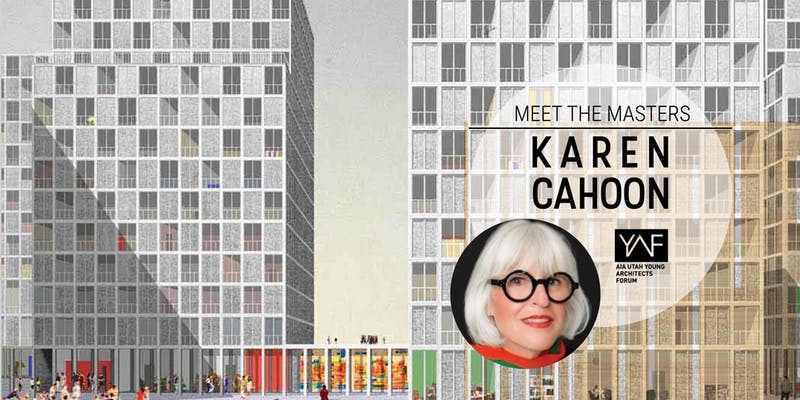 At this Meet the Masters we will have the privilege of hearing from Karen Cahoon, an interior designer who currently works at MHTN Architects. Karen grew up in Salt Lake City in the Highland Park District. She studied art at the University of Utah, then moved to California where she had the opportunity to learn from well-known designers of the time such as Charles and Ray Eames, Bruce Burdick and Bill Lear. She then moved back to Salt Lake City and studied interior design at the University of Utah where she learned about Basic Design, Graphics, Materials and had the opportunity to take a summer class from Massimo Vignelli at Harvard. Since then, she has worked in many capacities in the Interior Design Field and has enjoyed learning different aspects of this profession (interior design, sales, manufacturing). She is a valuable member of our design community and we are excited to hear form her!